Lenny's Sub Shop, a 600+ restaurant chain, now has plans for 41 restaurants in the Sacramento and Lake Tahoe, CA and Reno, NV areas. Recently Lenny's has opened several restaurants in new markets, including Las Vegas, San Antonio, and Charlotte. Lenny's is on track to open between 400 and 500 restaurants in the next few years. 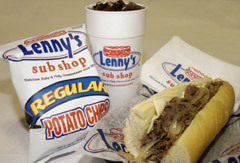 Len and Sheila Moore opened the original Lenny's Sub Shop, a genuine Philadelphia-style sub shop with fresh baked bread and the finest quality deli meat and cheese, in a Memphis suburb in 1998. Lenny's Franchisor Chief Executive Officer George Alvord and private investors acquired majority ownership of the company from Len Moore in 2004.